If there’s one thing better than getting to travel all over the world and eat all sorts of food, it’s getting paid to travel all over the world and eat all sorts of food. 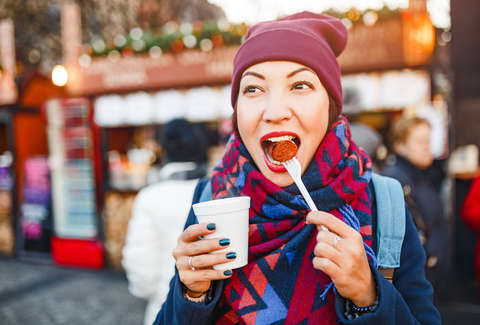 People spend their lives doing the former, but now, there’s a chance you can actually do the latter, thanks to a company that’s searching for a “Director of Taste,” who will get paid to travel the world, try new foods, and bring back recipe ideas -- for free. Vibrant Vegan Co., a UK-based vegan food subscription service that launched in 2017, will pay the one person £50,000 (about $65,000) to eat their way through India, China, Turkey, Chile, Mexico, Japan, and other countries in search of new ingredients, flavors, and recipes. The dream gig open to meat-eaters, vegetarians, pescatarians, and really anyone with a decent palate. The Director of Taste will be responsible for more than just tasting delicious food, though. You’ll also be in charge of setting up overseas partnerships for ingredient sourcing, so come prepared to make some deals between meals. Vibrant Vegan Co. is looking for someone with at least three years of experience in the food industry, and preferably, a degree in food science. Applicants will be put through full background checks and palates will be tested. The company’s founder, Iain Burke-Hamilton, told INSIDER, they’re looking for new talent “because I’m a firm believer that it’s the people that make a successful company.” He noted that while this job may sound like a walk in the park, full of unheard of incentives, it’s hard. “This is a very unique and rewarding job but despite its extensive perks, we acknowledge it’s also very demanding,” Burke-Hamilton said, per the report. According to Vibrant Vegan Co.’s job description, the job will require 35-hour work weeks, “with flexible working patterns available.” The person chosen will receive “full sick pay” and 28 paid holidays. Of course, if you get this job, you should be prepared to be away “for long periods of time.” While being a vegan isn’t a requirement, Vibrant Vegan Co. notes in its job description that the person selected for this role “must focus on solely plant-based ingredients.” All travel will be paid for by the company, along with accommodations and food. Sounds like a pretty sweet way to bring home some plant-based bacon, if you ask us. So, instead of eating your way around the world like it’s your job, there’s a chance you can finally start eating your way around the world because it is your job -- if you’re lucky (and qualified).